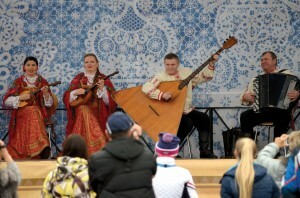 Groups wearing traditional clothing and playing indigenous instruments provided entertainment in the Olympic Park in Adler. 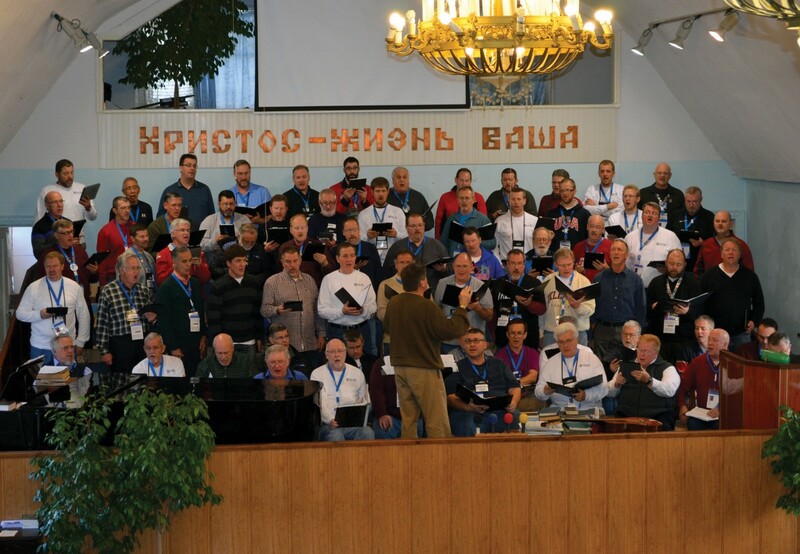 MOSCOW/SOCHI, Russia—Trusting God to lead them to divine appointments, 73 members of the Singing Men of Oklahoma and 16 companions traveled to these two Russian cities Feb. 4-14. As a result, at least two people experienced an eternity-changing encounter with Jesus Christ, and the seeds of His saving grace were scattered literally around the world. 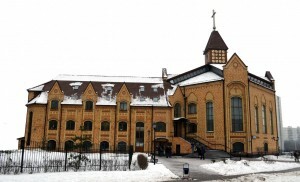 Participating in the Engage Sochi initiative, the group ministered first through three concerts in churches and other outreach efforts in the Russian Capital Feb. 5-9, before moving on to Sochi, the site of the XXII Winter Olympic Games, Feb. 9-13. Using specially-designed Olympic trading pins attached to a small tract with the gospel message printed in both English and Russian, the Oklahoma group set out to either trade the pins or just share them with others they met. Mark Spena and Doug Melton distribute food to homeless in Moscow. 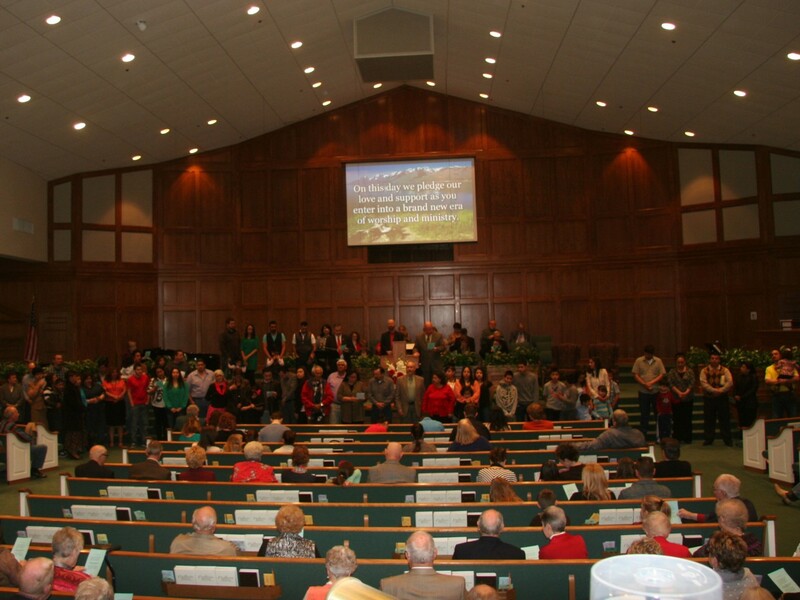 “It was awesome,” said director Randy Lind, worship and music ministries specialist with the Baptist General Convention of Oklahoma. ”From leaving to coming back, the group had great attitudes. They knew what the mission was about, and I think in every way, we accomplished that mission. It was a great blessing for me to see that as we got on the trains or buses or just walked down the street, they engaged people with the pins or established relationships with them and shared Christ as they could. Lind said despite security concerns emphasized repeatedly by the media, God’s hand of protection was on the group. Lind said two aspects of the trip were especially significant to him. The group sings at Central Baptist Church in Sochi. “One event near and dear to me was the opportunity to sing on the stage in the Mayor’s Plaza in Sochi,” he said. “That was something we tried to get permission to do when we had been there a year ago and they wouldn’t hear of that, but when we got over there, God opened that door spontaneously for us, and so we were able to sing there right outside of the mayor’s office. Several of the Oklahomans spent two days leading workshops for the students. “It was a pretty big bridge to build with them; the commonality of music, the commonality of having one Lord and worshipping together,” Lind stressed. As the larger group broke down into smaller units, other ministry opportunities opened up. Some prayer walked in the city’s famous 300-acre Gorky Park, praying for the people who were ice skating and snowboarding at the time and for the thousands of young people who will be coming to the park in the summer to participate in a number of activities such as basketball, volleyball and aerobics. 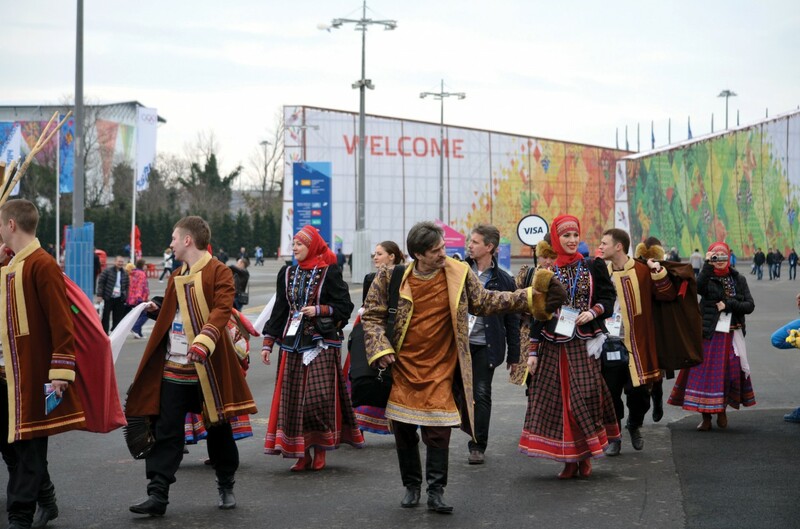 Groups wearing traditional clothing provided entertainment in the Olympic Park in Adler. Some of the men’s wives who are teachers spent time at Second Baptist Church with an English as a Second Language class, asking and answering questions and singing songs. 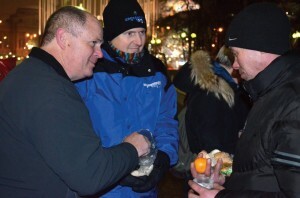 Another group was privileged to share God’s love with children in an orphanage and in an emotionally-charged setting one evening, the entire group sang for and helped distribute food to about 20 homeless men and women in a Moscow park. Physician Steve Ditto from Midwest City, Country Estates was able to consult with cardiologist Valentina Belahsova, and give her much-needed medical supplies and equipment to help her minister to members of 20 churches and nursing homes in Moscow. “We really appreciate the support of Anthony Jordan and many others here in the Baptist Building and from people in the churches all across Oklahoma in providing the knitted scarves and hats we were able to give away and for their prayers and financial support for their men who went on the trip,” Lind said. In Sochi, each participant was able to attend at least one Olympic event. Women’s ice hockey took center stage, with some watching Sweden defeat Germany, 4-0, and others witnessing the U.S. team drop a 3-2 decision to Canada in the preliminary rounds. Others were able to see Curling action. 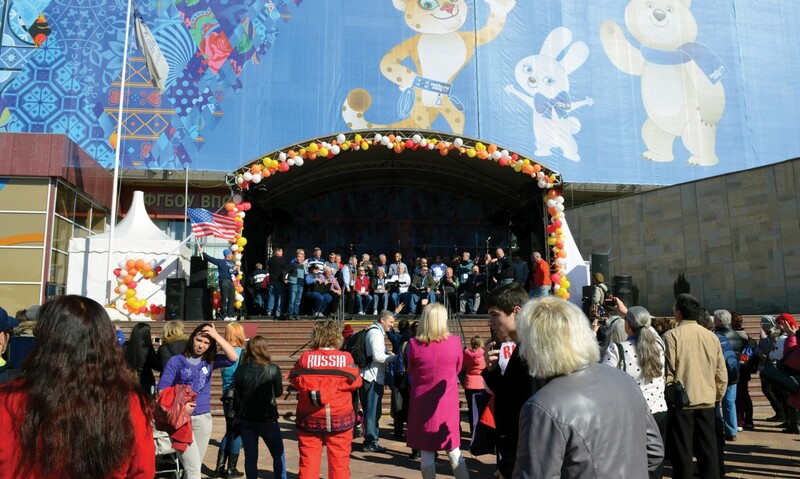 The men sing in the Mayor’s Park in Sochi with the official Olympic mascots providing. Kevin Willis, pastor of worship at Tulsa, Woodland Acres, was surprised by the group’s reception by the Russian people. 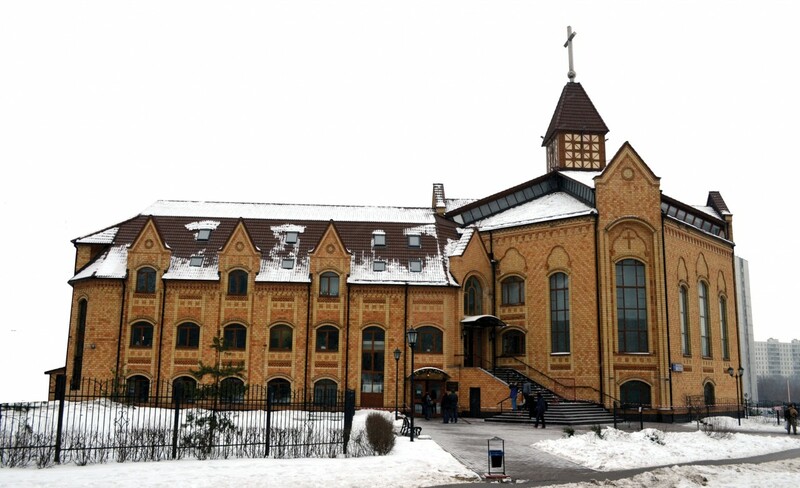 Golgotha Baptist Church in Moscow is an impressive landmark. He said he felt the group made an impact for the Gospel. Morris Neighbors, of Skiatook, Immanuel, the oldest member of the group at age 88, was awed by the scale of the Olympic Park in Adler. As for the group’s ministry, Neighbors said, “We have no idea how many people heard the Gospel through singing or just ministering. I was amazed how we could just stand on a street corner and start singing, and all of a sudden, there was a crowd there. They tried to sing along with us on some songs they knew, and when we got through, they clapped and smiled. I was really impressed when a couple of Russian boys jumped in front of us with a flag and tried to disrupt us and the crowd booed them down.